Martha at work. Summer 2012. Martha with her daughters, Julie and Laura. October, 2013. Martha South, LLC celebrates the life and artwork of my beloved mother, Martha Hill South. Thanks to Mom, I grew up surrounded by beauty. Physically, our house was a warm retreat, filled with sunlight, color, and eclectic art. Emotionally, our souls were nurtured by Mom's steady love and encouragement. And spiritually, Mom helped us to see - really see - beauty and joy in our day-to-day lives. 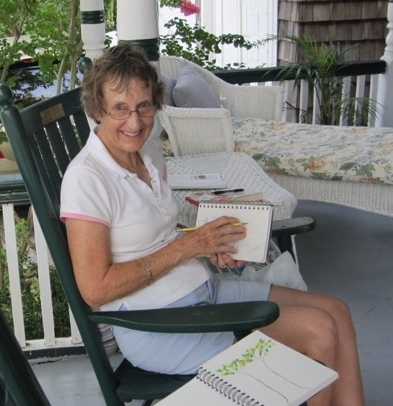 We frequently found her making sketches during everyday happenings. She would lean over and whisper, “I’m trying to capture the wonderful hat that woman three rows ahead of us is wearing - see how the light catches the red hues, and how the curve of the brim is echoed in the curve of the shoulder the person sitting nearby?” Before long, the small sketch would become a full blown painting that colorfully evoked this snippet of life. In addition to large scale works, mom delighted her friends and family with personalized cards featuring whimsical birds. My father, sister, and I, and eventually our children, opened birthday cards with great anticipation - what magical bird creation would we receive this time? Over the years, people asked if Mom's cards were available for sale, and she consistently answered “no.” But in the last year she and I decided to change the answer to “yes.” Together we picked out a set of cards for the first publication, reviewed paper stock, discussed envelope colors, and planned a business. Unfortunately, during this time Mom was also diagnosed with a serious illness, and passed away, much too soon, on November 28th, 2013. Though she is not physically present for the launching of our business, her spirit shines through each and every creation. Just as her artwork brought joy, laughter, and beauty into her family’s life, my hope is that it will do the same for you and your loved ones.